In most mammals extensive degeneration of germ cells occurs during the embryonic stages of oogenesis before follicle formation (1, 2). In the mouse embryo early morphological studies have shown two distinct periods of germ cell death affecting proliferating oogonia (12–13 days post coitum [dpc]) and oocytes at the zygotene/pachytene stage (from 16.5 dpc through birth) (3, 4). Following such episodes of degeneration the total number of germ cells decreases from about 30,000 on day 14 of fetal life to about 6000 to 10,000 at birth seven days later (2, 5, 6). 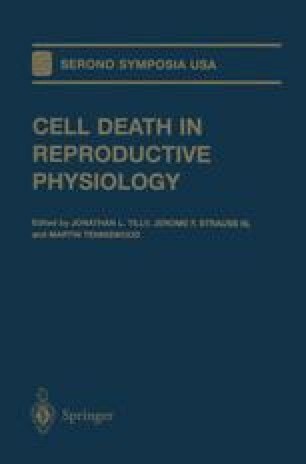 In the present paper, we report the results of studies carried out in our laboratory designed to elucidate the mechanisms of this massive cell death which were obscure until now. Given the current views on the physiological cell death that affects various cell types during development, we have investigated: first if germ cell degeneration requires the activation of an intrinsic cellular program, second if such a program displays the sequence of morphological and biochemical events characteristic of programmed cell death (apoptosis), and third if activator(s) or inhibitor(s) of this death program could be identified.